The John Day Tiger, closer to the size of a lion, recreated in a presumed ambush predatory posture. Passing through the Thomas Condon Paleontology Center in John Day Fossil Beds National Monument, near Picture Gorge, Ore., you'll find the geologic equivalent of Noah's Ark. Apparently, proto-cheetah, zebra, rhino and nearly every other conceivable terrestrial vertebrate wandered the Oregon countryside, according to a comprehensive fossil record starting 55 million years ago. Ever dreamt of what type of pet you might have had, if you'd lived that long ago? While the age of the earliest human found is a mere 200,000 years old, it never hurts to ponder. 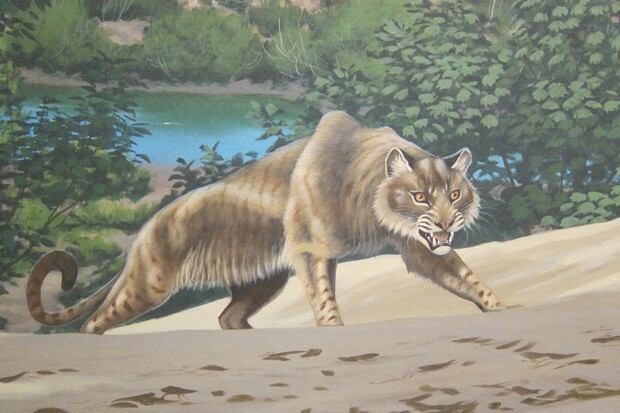 Among the creatures at the John Day Fossil Beds, three demonstrate choice pet qualities: the toy [false] sabertooth (Hoplophoneus), the mouse deer (Hypertragulids) and the John Day tiger (Pogonodon). TCPC's Chief of Paleontology and Museum Curator Nicholas Famoso defines fossils as, "Evidence of past life. For a fossil to be created, you need to have some evidence of past life get buried rapidly, with no oxygen, and it needs to be undisturbed for a while. Only about 1/10th of a percent of all life has been fossilized, so it is relatively rare." Famoso says we can tell much about these extinct, potentially domestic-able, house pets. The toy sabertooth was about the size of a bobcat (around 19 pounds) whereas the John Day tiger was closer to the size of a lion (about 280 to 420 pounds). The shape of each's arms and legs indicate they were ambush predators. OK, so these guys as cuddly pets might be a little overzealous... Note: The toy sabertooth is deemed a false cat due to having cartilage shaping the auditory region (ear canal) instead of bone. The charming Mouse Deer recreated in a landscape suitable for omnivorous browsing. 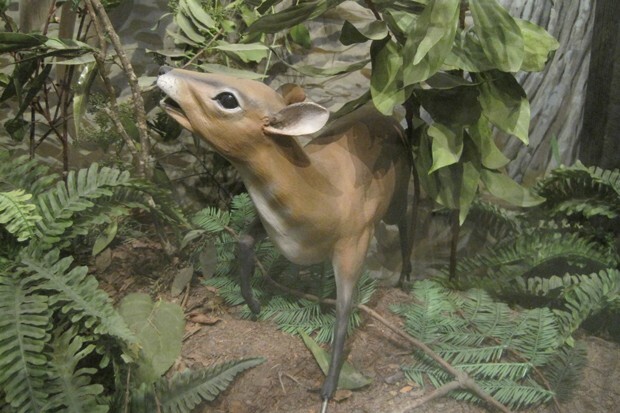 The mouse deer, meanwhile, were relatively small, common animals about the size of a modern chevrotain (between 3 and 12 pounds). 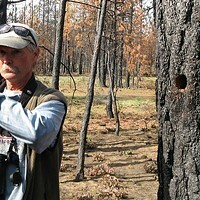 Three species were found in the John Day region, making up approximately 40 percent of the fauna in the John Day region at their population peak. Like deer, their teeth indicate browsing and they likely behaved in a similar way, hiding in the shelter of trees and brush. 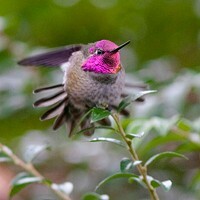 All of the species mentioned are believed to have resided in hardwood forests. Famoso chooses the John Day Fossil Beds' Cynarctoides lemur (a micro dog) as his "pet pick," because, as he says: "It was small and had giant ears. Very adorable." Separating predator from prey in the region can be tricky, Famoso says. "We can use the isotopes in the teeth of herbivores to get a general sense of what kind of plants herbivores are eating," he said. "Carnivores are even harder to figure out, but we can often use what we know about modern animals to help inform our hypotheses about the behavior of these extinct organisms." Fossils of the mouse deer and toy sabertooth were also found in California—which means immediate genetic cloning and subsequent trademarking is of the utmost importance. Thus far, the John Day tiger has only been found in Oregon. As a pitch for the rarity and importance of the resources found in the formations northeast of Bend, Famoso reveals, "John Day Fossil Beds preserves a very long record of evolution and climate change that cannot be found anywhere else in the world. About 45 million years of time is represented, minus a couple of million-year gaps. The [John Day] fossil record is also very rich and abundant and contains many volcanic ashes, which help to figure out timing of when these animals lived. All of these things help to make the fossil record at John Day Fossil Beds a world-renowned place."